It has been a bear week on the Moose-Wilson Road. My sum total of bear sightings on this road over the last ten years has been two. This week I have seen the same bear twice and come close on several other occasions. 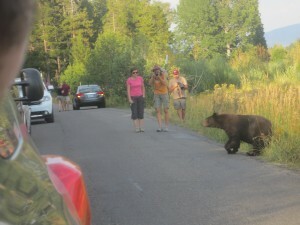 What gets me is the lack of caution displayed by people eager to photograph bears. Especially in this day of zoom lenses and high performance cameras you would think people would depend more on technology than proximity. But as you can see below that is not always the case. This particular bear, I am not sure if it is a black or sub adult grizzly, was walking through the brushes and bathing in a stream running parallel to the narrow road. Suddenly it came out of the water, shook off like a dog, and made tracks for the pavement. I was safely in my car, but there were no Park Rangers present when the bear stepped out into the open. The same cannot be said for some, perhaps over eager photographers, who in my judgment were way to close. I’m “just saying” of course. Fortunately, nobody was injured and the bear continued to the brush on the other side. The next day, I saw what I believe to be the same bear eating peacefully along the road once again. However, this time rangers were keeping people at a safe distance. The moral of this story is you should enjoy the animals but respect them. Never get too close to a bear or a moose and always have an exit or protective strategy (for a bear usually bear spray or very close to your car – not a tree to climb) when trying to view wildlife. Never ever run – THEY MAY CHASE YOU! The animals are called “wild” for a reason. The Grand Teton National Park web site says you should always remain at least 100 yards from a bear and carry bear spray. They are not saying it to annoy you. They are saying it to protect you! If you have any comment concerning this Post or have observed behavior that would be instructive to others please comment. August 29, 2013 - At least two grizzly bears were seen on the Elk Range in the last ten days. It could herald a southern expansion of grizzly bears. August 29, 2013 - Police are standing guard on a path used by children on their way to school in Jackson Hole after a mountain lion was spotted. May 7 - This Story Is About The Spring Controlled Burn Season. After the fires last year it is all of a sudden real relevant. May 4 - Bear 610's cubs left her to find their own fortune. Years ago I had the pleasure of seeing her amble by my car in the company of her mother, Bear 399.